hey cool blog! 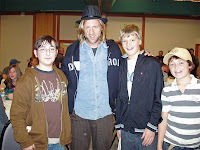 Small correction: it's actually JON from Switchfoot that you met. Matt is from Relient K.
I did goof this up. Thank you.